Last month we talked about the trends in culling and death loss that are coming from our database over the last 11 years. This month we want to continue with the topic but look at the reasons that are showing up in the data for culling and death loss. One of the first things that stood out to us is the number of young sows leaving the herd. 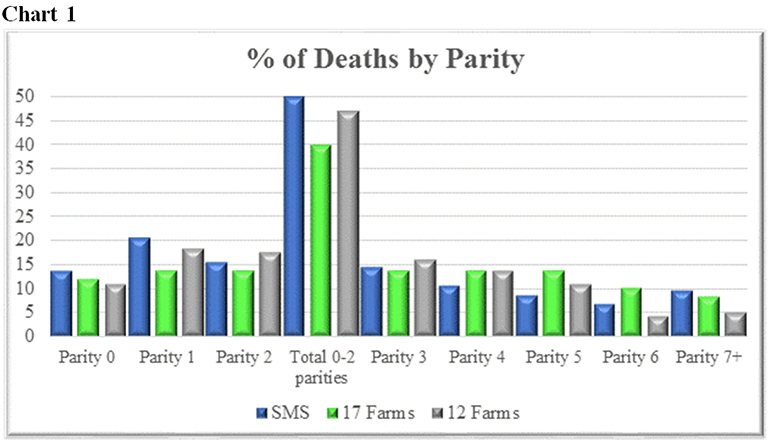 Chart 1, “Percentage of deaths by parity,” shows that in the Swine Management Services data set of 1.5+ million sow, a 17-farm system and a 12-farm system had between 40-50% of the deaths come from Parity 0-2 females. 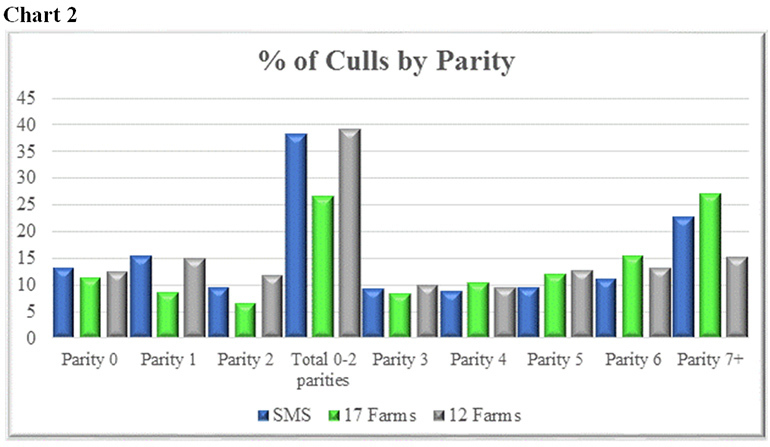 Chart 2, “Percentage of culls by parity,” shows that 27-39% of the culls are coming from those young sows as well. Please note that you cannot add the 50% and the 39% together to get fallout of 89% in parity 0-2, these numbers are looking at two different groups of animals. What is causing more and more young sows to fall out of the herd? Is it the amount of stress the females are under at a younger age, type of housing they are developed in or housed in as sows, individual pig care changes, or some other unknown factor? Is there something you can do to reduce this high death rate and culling of younger females in your operation? 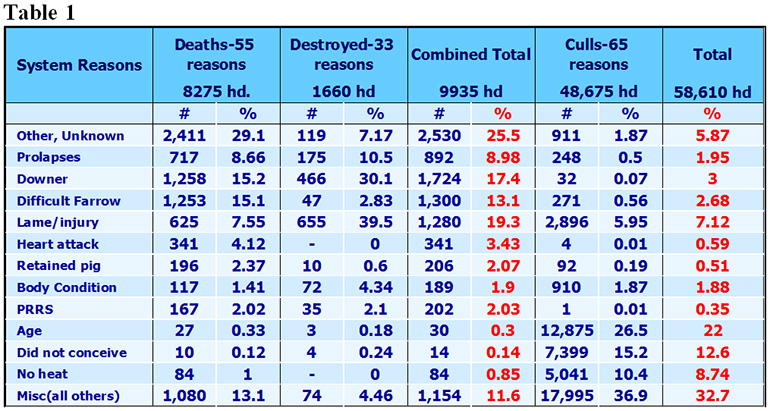 For Table 1 we broke out reasons for deaths, destroyed and culls across 18 individual farms. Not all record programs track deaths separately from destroyed. There were more than 50 reasons listed. We combined the reasons that were less than 1% into the bottom line of “Misc” which ends up totaling 11.6% of the combined destroys and deaths and 32.7% of the cull reasons. A total of 25.5% of the deaths and destroyed animals were due to an “unknown” reason. So, off the top, we have no idea why one quarter of the sows were lost, was it really for an unknown reason or was it because the known reason was not recorded? On the other side, there are animals that “died” because of things like “no heat” or “age” which really aren’t death reasons. On the culling side, there were Parity 1 females culled for age or heart attacks. This all indicates that there is some work to do to get more accurate records. The No. 1 reason for deaths and destroyed among the 18 individual farms was lame/injured sows. The No. 1 reason for culls was all of those reasons that made up less than 1% of the culls, totally 36.9% of the culls. Followed by 26.5% for age. Adding deads and culls together the No. 1 reason for removal from the herd was the “Misc.” followed by age. An industry-wide effort to consolidate and standardize cull and death reasons would be beneficial as we continue to look at and study this in the future to get the most from the data. Each producer should at least review their list of reasons for deaths and culls and help staff to understand the importance of the accuracy of removal reasons. Table 2 looks at a 12-farm system. This system had 60 different reasons for culling or deaths. A major difference between this system and the 18 individual farms that were looked at in Table 1 is that prolapses contributed 19.3% of the death loss in the system while only 8.98% of the 18 individual farms. In addition to the sows that were dead or destroyed, another 4.32% of the culls were removed from the herd because of prolapses in the 12-farm system over the last three years. Prolapses contributed to an overall herd removal of 3.6% for the system while lameness and injury accounted for only 4.1% of the overall removal. The biggest reason for deaths and euthanization for the 12-farm system was “Acute Deaths” which were 45.25%. We wonder what that reason really was? There is much to be learned as the industry continues to have more loose housing and higher-performing sows. How we once cared for them may no longer be what is needed. A 1% change in sow death loss is equal to 0.25 pigs weaned per mated female per year. Working together to ensure that staff understands the importance of treating sows, the financial costs of sow mortality and the impact on the industry are very important to the overall success of the herd. 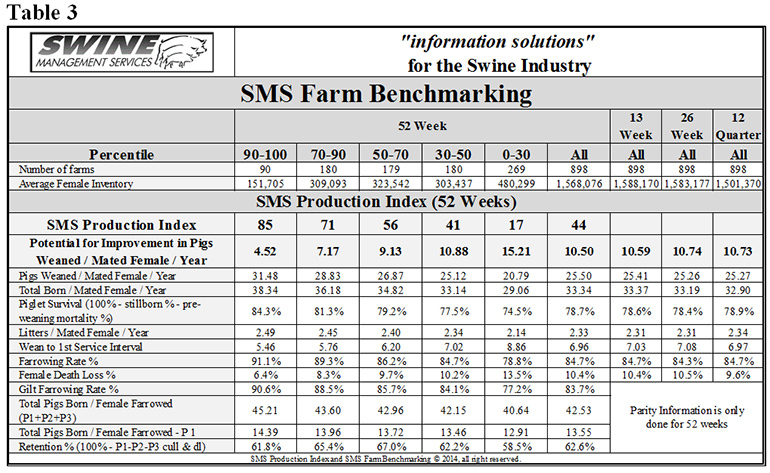 Table 3 provides the 52-week rolling averages for 11 production numbers represented in the SMS Production Index. The numbers are separated by 90-100%, the 70-90%, the 50-70%, the 30-50% and the 0-30% groups. We also included the 13-week, 26-week and 12-quarter averages. These numbers represent what we feel are the key production numbers to look at to evaluate the farm’s performance. Take a look at the row for Female Death Loss percent with the farms in the 90-100 percentiles at 6.4% compared to farms in the 0-30 percentile at 13.5%. What does that tell you? At SMS, our mission statement is to provide “Information solutions for the swine industry”. We feel with the creation of different SMS Benchmarking databases for all production areas we now have more detailed information to share with the swine industry. If your farm would like to be part of the SMS Benchmarking databases, or if you have suggestions on production areas to write columns about, please contact us Mark Rix, Ron Ketchem or Valerie Duttlinger. We enjoy being a part of the NHF Daily team. Previous columns can be found at NationalHogFarmer.com.